Anti-Ro/La negative congenital heart block (CHB) is uncommon. We report one such case of CHB, with no associated structural heart disease or maternal autoantibodies. The heart block reverted to sinus rhythm spontaneously at two weeks of age, and the patient remains in sinus rhythm at a one year followup. Whether patients with antibody negative complete heart block have a different clinical course is conjectural. Congenital atrioventricular (AV) block is a rare but important cause of neonatal bradycardia, which occurs in approximately 1: 15,000-1: 22,000 live births. Isolated congenital heart block (CHB) is mainly associated with the neonatal lupus syndrome, but it can be observed in children whose mothers have other connective tissue diseases, such as Sjögren's syndrome. Nearly half of the mothers do not have connective tissue disease when their children are born with CHB, but most of them have anti-Ro/La autoantibodies. Anti Ro/La negative cases constitute around 30% of all cases of CHB, which are mostly associated with structural heart defects. There have been few reports of non-immune CHB without associated structural heart defects, with their prognoses being largely variable. We report a case of congenital AV block, with no associated structural heart disease or maternal autoantibodies. A single-term, appropriate-for-date, girl baby, with birth weight 2478 g, born out of a non-consanguineous marriage to a 24-year-old primigravida mother, presented at birth with a heart rate of 45/minute. The baby was born by normal vaginal delivery and had APGAR scores of 7 and 8 at one and five minutes. The obstetric history revealed documented fetal bradycardia during labor, but normal heart rate on the ultrasound scans at 18 and 35 weeks of gestation. The mother had no history of gestational diabetes, hypertension, hypothyroidism, any fever with rash, or drug intake during pregnancy, nor did she have any symptoms suggestive of connective tissue disease. There was no history of cardiac disease in the family. At birth, the baby was otherwise healthy with a heart rate of 45/minute, without any symptoms of congestive cardiac failure. Serum electrolytes were normal and echocardiography revealed no structural heart disease. The baby was put on continuous electrocardiographic monitoring. The electrocardiogram (EKG) on day one revealed complete AV dissociation with an atrial rate of 115/minute, ventricular rate of 45/minute, QRS duration of 0.08 seconds (occasionally > 0.08 seconds), corrected QT interval (QTc) of 0.48 seconds, and an left bundle branch block (LBBB) pattern [Figure 1]. EKG on day three revealed no AV dissociation with both atrial and ventricular rates of 93/minute and QRS duration of 0.08 seconds [Figure 2]. Although the EKG reverted to sinus rhythm, the PR interval (0.18 seconds) was prolonged, the QRS duration was at the upper limit of normal, and the EKG showed a right bundle branch block (RBBB) pattern. There was marked ST depression in V1 and marked right axis deviation, indicating normal right ventricle (RV) dominance in the newborn period. 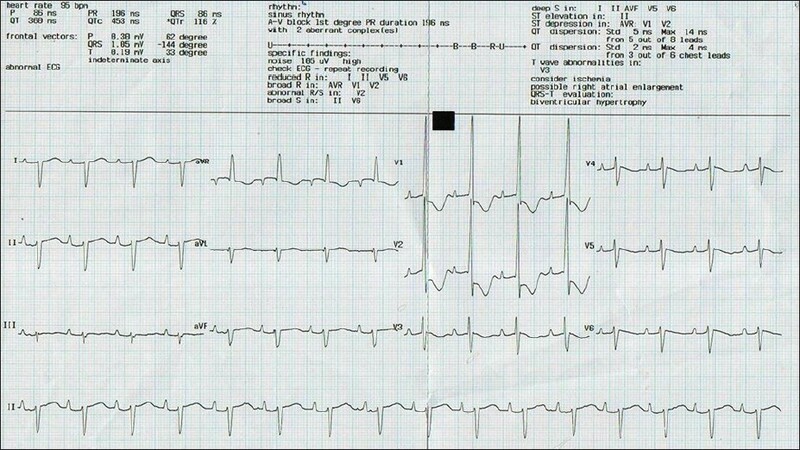 The EKG on day four showed a similar picture as on day three with a rate of 107/minute. On day six, however, the bradycardia again worsened. This time the ventricular rate varied between 45 and 60/minute, atrial rate was 150/minute, and QRS duration was 0.08-0.1 seconds. This pattern prevailed over the next seven days. From day 13 onward, there was spontaneous improvement, with disappearance of AV dissociation and atrial-ventricular rates improving to 100/minute. The baby remained asymptomatic during the hospital stay. Cardiac function was regularly monitored using functional echocardiography, and the fractional shortening (FS%) was found to range between 32 and 38% during this period, which was normal for term neonates. Hence, cardiac pacing was withheld. The baby was discharged on day 29 of life. During this period, the heart rate varied between 85 and 120/minute, but no further episodes of AV dissociation were noted. The mother was tested for serum anti-nuclear antibody using the indirect immunofluorescence technique. Subsequently the mother's serum was subjected to antigen-specific enzyme immunoassay, using microtiter plates coated with a combination of antigens SSA/Ro, SSB/La, Sm, U1-RNP, Jo-1, and Scl70. The test results were negative. The baby was followed up weekly for two months, then every fortnight for the next 14 months [Figure 3]. The baby did not develop any such episodes further. Serial echocardiography during this one-year follow-up revealed no evidence of any cardiac dysfunction. EKGs were done in both the parents and were found to be normal. Anti Ro/La negative CHB without structural heart defects is rare. The presence of maternal anti-Ro (SSA) or anti-La (SSB) antibodies have been demonstrated in most cases of isolated congenital AV blocks, with the presumed mechanism being that of immune complex deposition with specific damage to the fetal cardiac conduction system. However, Brucato et al., and Maeno et al., observed CHB in 20 and 18% of mothers with anti-Ro/La negativity, respectively. , Among them, two fetuses had a second-degree AV block, one progressing to complete block soon after birth and the other at three months. The block alternated with normal sinus rhythm in the other two infants and reverted to a stable normal sinus rhythm in one patient. Bruer et al., reported a series of four patients where fetal heart block was found to occur in the absence of structural heart defects and maternal autoantibodies to SS-A/Ro and SS-B/La. These neonates were also found to exhibit an unstable pattern of AV block, with the blocks changing their degree and often reverting to sinus rhythm. 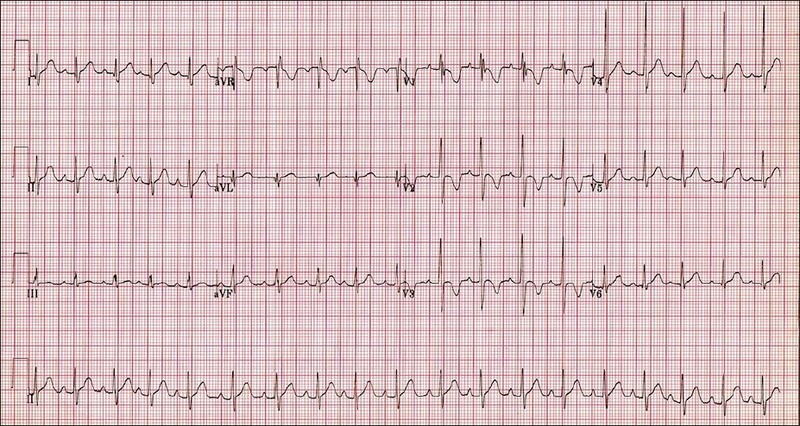 Our case exhibited a similar clinical course with an unstable pattern of AV block alternating with sinus rhythm. In conclusion, the prognosis of congenital complete heart block in the absence of anti Ro/La antibodies may be relatively better. However, the entity may result from different causes. Further characterization of this subgroup is required. We acknowledge the contribution of Dr. Achyut Sarkar, Professor, Department of Cardiology, in providing valuable guidance during management of the case. 1. Michaelsson M, Engle MA. Congenital complete heart block: An international study of the natural history. Clin Cardiol 1972;4:86-101. 2. Waltuck J, Buyon JP. Autoantibody-associated congenital heart block: Outcome in mothers and children. Ann Intern Med 1994;120:544-51. 3. Moore JP, Satou GM, Klitzner TS. Arrhythmias in the Newborn and Fetus. In: Gleason CA, Devaskar S, editors. Avery's Diseases of the Newborn, 9 th ed. Philadelphia: Saunders; 2012. 4. Salomonsson S, Ottosson L, Säfsten P, Hof D, Brauner H, Sunnerhagen M, et al. Cloning and characterization of two human Ro52-specific monoclonal autoantibodies directed towards a domain associated with congenital heart block. J Autoimmun 2004;22:167-77. 5. Brucato A, Grava C, Bortolati M, Ikeda K, Milanesi O, Cimaz R, et al. Congenital heart block not associated with anti-Ro/La antibodies: Comparison with anti-Ro/La-positive cases. J Rheumatol 2009;36:1744-8. 6. Maeno Y, Himeno W, Saito A, Hiraishi S, Hirose O, Ikuma M, et al. Clinical course of fetal congenital atrioventricular block in the Japanese population: A multicentre experience. Heart 2005;91:1075-9. 7. Breur JM, Oudijk MA, Stoutenbeek P, Visser GH, Meijboom EJ. Transient non-autoimmune fetal heart block. Fetal Diagn Ther 2005;20:81-5. 8. Julkunen H, Miettinen AA, Walle TK, Chan EK, Eronen M. Autoimmune response in mothers of children with congenital and postnatally diagnosed isolated heart block: A population based study. J Rheumatol 2004;31:183-9. 9. Buyon JP, Hiebert R, Copel J, Craft J, Friedman D, Katholi M, et al. Autoimmune-associated congenital heart block: Demographics, mortality, morbidity and recurrence rates obtained from a national neonatal lupus registry. J Am Coll Cardiol 1998;31:1658-66. 10. Berg C, Geipel A, Kohl T, Breuer J, Germer U, Krapp M, et al. Atrioventricular block detected in fetal life: Associated anomalies and potential prognostic markers. Ultrasound Obstet Gynecol 2005;26:4-15. 11. Baruteau AE, Fouchard S, Behaghel A, Mabo P, Villain E, Thambo JB, et al. Characteristics and long-term outcome of non-immune isolated atrioventricular block diagnosed in utero or early childhood: A multicentre study. Eur Heart J 2012;33:622-9. 12. Lin MT, Hsieh FJ, Shyu MK, Lee CN, Wang JK, Wu MH. 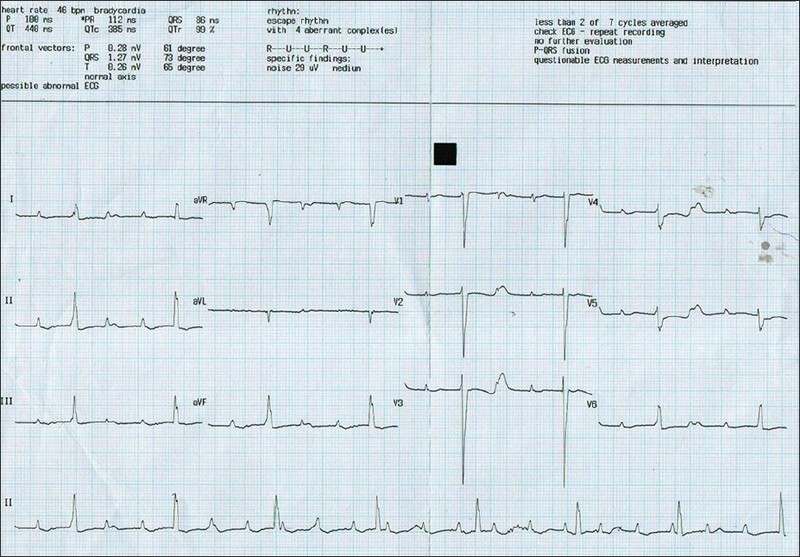 Postnatal outcome of fetal bradycardia without significant cardiac abnormalities. Am Heart J 2004;147:540-4. 13. Chang YL, Hsieh PC, Chang SD, Chao AS, Liang CC, Soong YK. Perinatal outcome of fetus with isolated congenital second degree atrioventricular block without maternal anti-SSA/Ro-SSB/La antibodies. Eur J Obstet Gynecol Reprod Biol 2005;122:167-71.